Copying, scanning and printing capabilties on one device. True 1200x1200 dpi resolution delivers charts, graphs, photo and reports with sharp text and vivide colors. 22 ppm in color and black & white. Scanning to desktop or email at 80 ppm. Standard dual 500 sheet paper with deliver paper sizes up to 11x17. Copying, scanning and printing capabilties on one device. True 1200x1200 dpi resolution delivers charts, graphs, photo and reports with sharp text. Air print allows printing from smart phones. 22 ppm black & white. 0verages on black & white billed @ .038 cents. Color copies billed @ .07 cents. Overages on black & white billed @ .038 cents per copy. Overages on black & white billed at .01 cents per copy. Color copies billed at .07 cents. 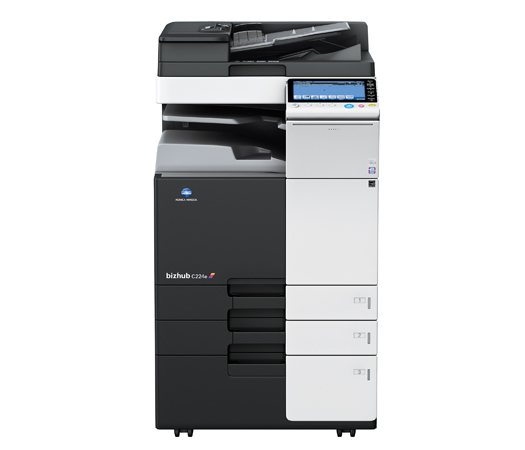 Konica Minolat Bizhub 4 series machines.